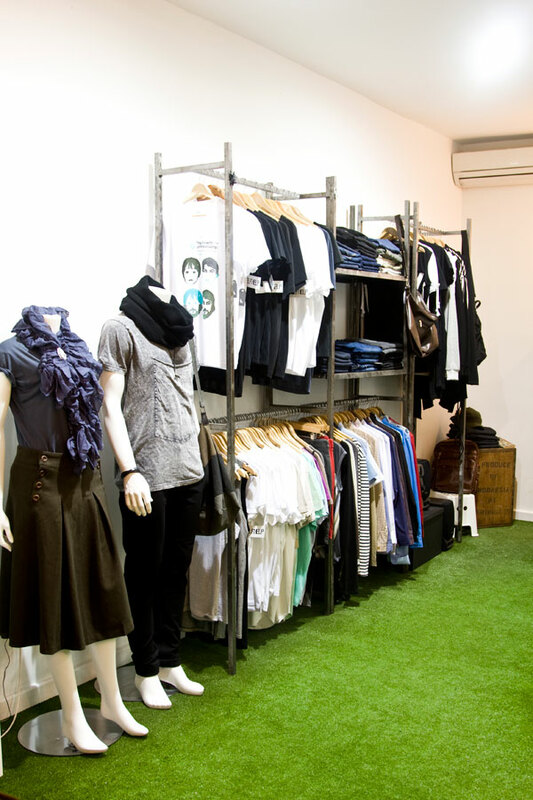 Johann shares about his Perth shop ‘Pigeonhole’ with FK. Explain the Pigeonhole story, how did you get started and what inspired you to open your shop/s? I used to design fashion accessories during uni and sold it to stores in Perth, Sydney and Melbourne. It just kind of happened one summer but that’s what got me interested in boutique retail. I opened Pigeonhole after a year of traveling and finishing my law studies in Copenhagen. During that time I made accessories and sold them to stores in Copenhagen, Stockholm, Oslo, Hamburg and London. It was a pretty great way to travel and I got to search out all the groovy shops in northern Europe and gain inspiration out there. I’d thoroughly recommend it! During that time I got inspired to open my own store once I got back… originally I thought I’d just open a really tiny accessories boutique and fill it with pigeonhole shelving to save space… I ended up finding a shop which was a bit bigger than originally thought, but still pretty teeny at only 27 metres squared and tucked down a long forgotten arcade in Perth city. When I signed the lease I had no money in the bank but I wasn’t asked for a bond and I asked for 3 months rent free to set the shop up… I got a grant and took my jewellery to a tradefair in Melbourne and with the sales from that and a lot of help from friends, I opened up Pigeonhole on Oct 6 2007 (my 25th birthday)! It took a long time to open and was a lot of hard work and many quiet days… but had some loyal fans who kept us ticking in the early days – and I’m really grateful for their support especially in those early days! I opened our wholesale office 6 months later in July 08. Before that we had an old storeroom with 1 light and 1 window and a couple of 17 year old boys helping us out for free running around barefoot amongst towers of boxes and junk. Haha! I opened our second store in December 08 on the other side of the city. It’s also tucked down a little laneway and is also a very small store. This store took us 6 days from getting the keys to opening the doors! That was pretty fun! Haha. This store is a little different to the first, it’s a bit more designy and gifty and is at the more business end of town but it’s still distinctly pigeonhole. 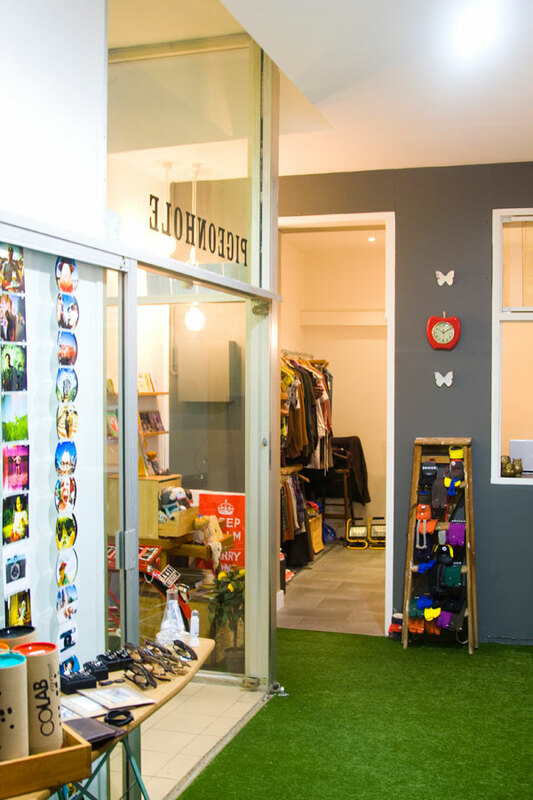 What kind of treats and treasures can we expect to find at Pigeonhole Stores? Where do you source your stock from and what are you always searching for? I have a soft spot for Scandinavian design as I spent 6 months in Copenhagen a few years ago and just loved the less is more approach to design over there. So you’ll find a lot of things from northern Europe in my stores. I do a lot of travel through Asia especially in order to do production for our inhouse accessories lines. So I like to get little bits and pieces whenever I travel, whether from Singapore, Hong Kong, Tokyo, Bangkok or Seoul.! We do get a lot of people come into our shops showing their products and clothes to us too so that’s always fun to see what local people are up to. Sometimes you get some really great suprises such as these fantastic magic wallets shaped like cassette tapes by a local duo called Assettes – we’ve started distributing the wallets around Australia for the fellas cos they’re just so good! I go to Sydney and Melbourne about 2-3 times a year and go overseas around 4 times a year. And when I’m not on a plane then I’m researching for new things online. There’s a lot out there just waiting to be discovered! The kinds of products that I like the most are generally from smaller more offbeat designers. I go for bold colourways items that are a little retro, nostalgic or that have some quirky narrative or story. Most items have some story behind them at any rate – be it a personal affiliation with the designer, a story of discovery from some obscure part of the world, or some other funny tale or other. There’s always something random in the stores, but that’s what makes it fun. What is most unique about Pigeonhole and why do you feel it’s an important addition to Perth? I think that Pigeonhole is unique because of the community built around it. We run events such as art openings, photo exhibits and small parties in our stores to encourage local artists and inspire our customers to get creative! We’re holding an annual event called lomovember which is a Movember fundraiser exhibiting lomo photography from local photographers. We held it last year and had so much fun with it we think we’ll have it as an annual event and hopefully get other lomo enthusiasts around the world to hold the event too – I think that’d be kinda cool! Recently we had an art show called Riding With Wolves to celebrate the addition of new Swedish bicycles and some cool Italian wolf sculptures at our new store. we got some local illustrators to do some plywood canvasses and we had a show just for kicks. I guess that’s what makes Pigeonhole a little different – we want to harbor a creative community around what we do. That’s what makes it interesting and worth being a part of. I think it’s important to provide a platform and opportunity to harbor creativity and to inspire people to do what they really want to do. I like to hope that Pigeonhole is a place where anyone can feel like they are welcome to be a part of the community and can be a part of something. For us folk on the other side of Australia, what is the Perth art & design scene like? Perth is a small city but with a strong creative hub bustling under the surface. The art and design scene is small but strong and tight knit. There’s a lot going on right now – heaps of shows, new spaces, studios and lots of fresh work out on display. The creative community here is really supportive and friendly – stores and galleries are really open to new work and encouraging people to get out there and I think people over here are really willing to give things a go. It’s also really young – we’ve got lots of young artist in their early twenties getting out there, doing new work and getting profile around here. I guess that means that things over here are pretty raw, but always fresh. What inspires you about your surroundings and what other aspects about Perth do you love? I love Perth – I love the familiarity about it. I lead a very very busy life, so I like to have a fewer choices during my downtime! I like the fact that there are only a few options on the weekend, and only a few good places to eat and go to as it makes my decision making much easier. I know, I know, that sounds pretty boring huh! But it’s actually really nice. Perth is also fantastic as there’s great weather, happy people, supportive community and lots of opportunities. What more can you ask for! I think the past lack of creative things in Perth is one thing that inspires me to do more! but also when I see and hear of perth people doing new and different things this also inspires me to keep at it also and encourage others to do the same! 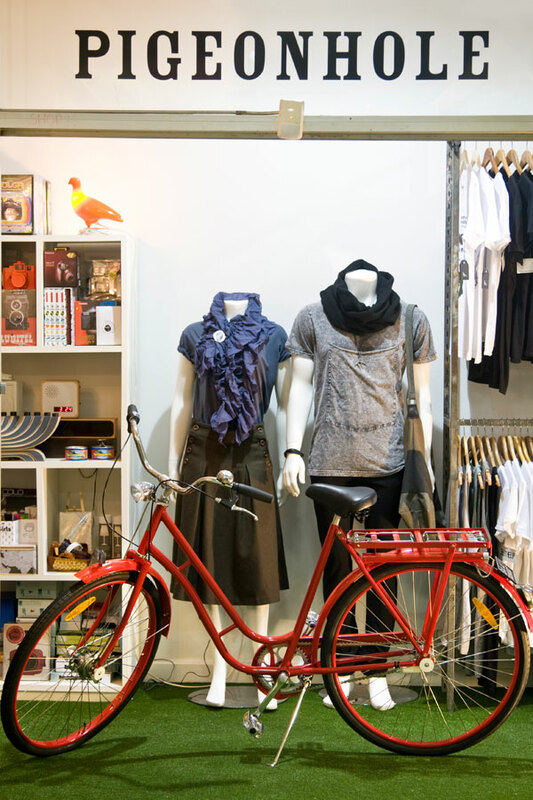 What was the most challenging aspects of starting & running Pigeonhole and starting new stores? The hardest thing about starting a store was just the huge variety of jobs that need to be done at all times. Even now in my 2nd year of business I go to bed most nights around 3 or 4am and work round the clock. It can be really lonely at times as well as you just have to knuckle down and do the work as there’s nobody else there to do it. That means turning down social engagements left right and centre and just pushing yourself to the limit for long periods of time… but this is also what makes it worthwhile as you can really see the rewards of your efforts! Now that the shops have been running for a little while the hardest thing is building a good team and making sure that it’s running smoothly. I always thought that I would be a better boss! But I’ve never had a proper job before and so have never had a boss before either! So I have no idea if I’m doing it right or not! Thankfully I have some really great people working with me but it still scares me having all those people under me! I guess managing money is probably also one of the most difficult things about having a business. Starting new stores takes up a lot of money, and there are never any guarantees that you can sell enough to pay off what you need! You have to have a lot of faith and just make decisions hoping that they’ll work – it’s kind of like playing a boardgame but with real money. It’s pretty scary but exhilarating at the same time. Get as much advice as possible. I am a sponge when it comes to listening to others who’ve got their own businesses also – I listen to what other store owners and designers have to say and try to take on board as much as possible. There’s always someone with more experience than you and you need to be humble enough to listen and learn from them, which means you need to ask questions all the time. Having lots of mentors and advisors is really helpful to staying afloat and motivated. You also need a strong team around you. As the business grows, there’s only so much that you can do as one person.. learning to give up areas of responsibility to others is really important as well as getting as much outside help as possible. At the moment we have 7 paid staff and 4 interns working with Pigeonhole. We’ve also got a lot of people that come and help out in different ways, whether it’s our IT, handiwork, extra manpower, events or odd jobs. If it weren’t for the extended pigeonhole family we really wouldn’t be able to do half as much as we do right now. Finally, you have to have a can do attitude about everything and never give up. You need to adapt to your situation – things very rarely turn out the way you want them to so you need to be flexible to change tact if you need to as well as putting in the long yards to make it work! You can’t be afraid of long long hours and hard work… but also for rest when it’s due! I try to make sure that I take a whole day off work every week. It makes a huge difference… but when I work, I work like crazy! Where would you like to see Pigeonhole in the future and do you have any new goals? I’d like to keep extending the creative pursuits of pigeonhole – more shows, more collaborations with artists and more spaces! I’d love to be able to open up pigeonholes around the country and trying to keep the same sort of community built around each store. I’d also like to continue growing the design and distribution side of the business. 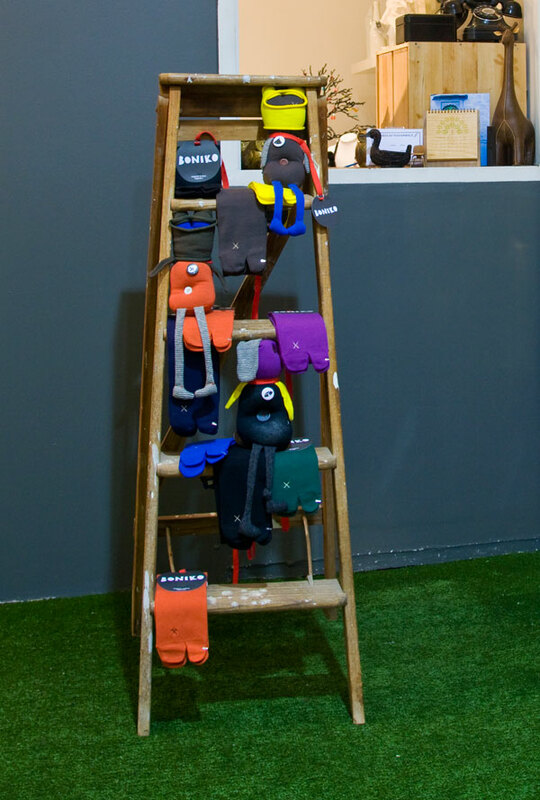 We sell our range of fashion accessories and design products to stores across Australia and New Zealand. A lot of these we design in house, but we also are exclusive distributors for some cool design houses from around the world! Hopefully we can keep this up with new products every season and more collaboration with great designers from around the world! We originally started with jewellery, but now we’re doing bags and have recently tried tees. It would be fun to do more and more in house design and in various new fields such as stationery, fashion, design products and who knows what else! As I said, we’re about harboring a creative community – so hopefully we’ll keep getting more and more people connected with us that share the same vision and passion for growing community, enjoying creativity and having fun growing business. And well, if you’ve got the right people, the world’s your oyster! Late night Friday until 9pm. I visited the London Court store in January, I nearly walked right past it because it was so small. I’m glad I found it though because it was a real gem of a store. I was visiting from Melbourne and it was so lovely to see pockets of unique and crafty stores hidden throughout Perth. 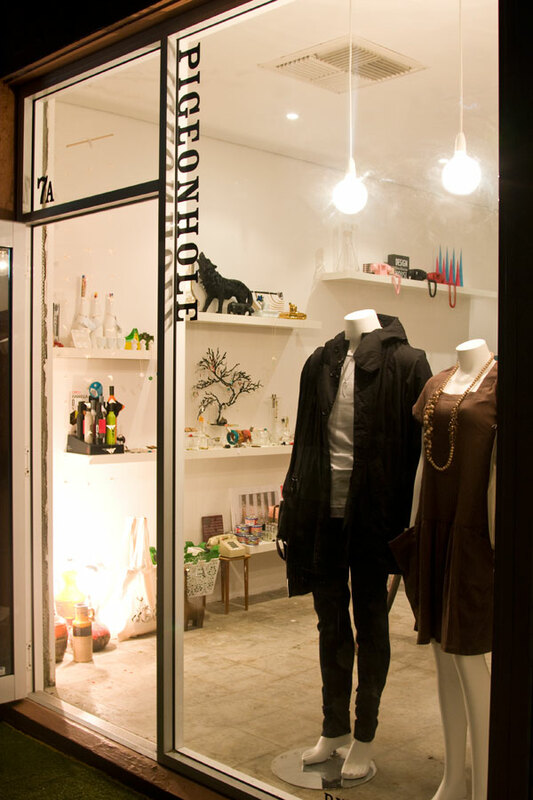 I live in Perth and would like to say Thankyou Pigeonhole for your outstanding uniqueness and extra friendly, creative staff who inspire me continue with my journey of great ideas because they always look so happy to be where they are!